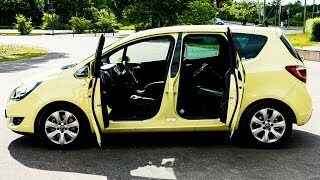 Opel has revealed the details of the 2014 Meriva which is more sophisticated, more efficient and more functional than ever and it will have its world premiere at the Brussels’ motor show in mid-January 2014. The new Meriva gets a new front fascia which features a new chrome grille, fog lamps with chrome accents, LED daytime running lights, a new elegant chrome beltline on the side, FlexDoors and newly-designed 17 and 18 inch wheels with premium look and feel. Meriva is the only small monocab offering 18-inch wheels which give it a unique stance and presence on the road. The Opel Meriva benefits from a re-designed multifunctional FlexRail central console with improved functionality and increased rear passenger legroom in the central seat. The new Meriva also receives a new generation, state-of-the-art IntelliLink infotainment system. It also gets a rear view camera and to complete the Meriva’s all-round ‘feel-good’ sensation, a heated steering wheel function and a large sunroof for star-spotting are also on offer. 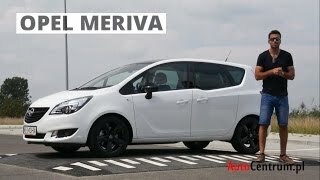 The 2014 Opel Meriva boasts the new generation Opel 1.6 CDTI medium-displacement turbo-diesel engine. It is initially available in the power variant 100 kW/136 hp and delivers 320 Nm of maximum torque. It consumes just 4.4 liters per 100 kilometers and emits 116 grams of CO2 per kilometer. The new Meriva swiftly reaches 100 km/h from standstill in just 9.1 seconds. 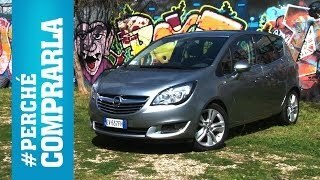 The new Meriva is also available with a choice of three 1.4 liter gasoline engines. The naturally-aspirated entry-level version produces 74 kW/100 hp. The two turbo-charged variants offer 88 kW/120 hp and 103 kW/140 hp.